Cst. 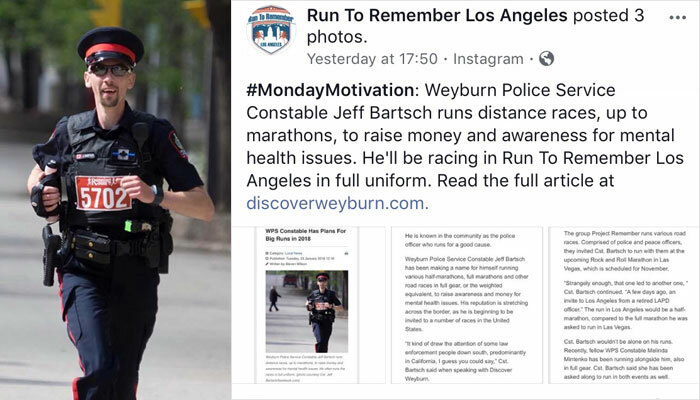 Jeff Bartsch of the Weyburn Police Service in Saskatchewan is an avid runner. He has taken his passion and runs road races, marathons and half marathons for mental health awareness. What is unique about Cst. Bartsch’s runs is that he does it in his full police uniform. Over the last number of years mental health and PTSD has become more recognized in first responders, including the law enforcement community. Cst. Bartsch has become an advocate for mental health and is running to make people aware not only about mental health, but that there is help for those suffering. He also runs in memory of the three officers killed in the Line of Duty in 2017: Constable John Davidson, Constable Frank Deschenes, and Constable Richer Dubuc. On April 8, 2018 Cst. Bartsch will be running in the 2018 Run To Remember Uniform Challenge 21.1 km Half Marathon in Los Angeles, California alongside US law enforcement running to honour their fallen. All monies raised through Jeff’s fundraising campaign will go to fulfilling the objectives of the Memorial Ribbon Society, including providing for scholarships for the children of fallen officers. To help Jeff meet his goal and support the Ribbon Society and their goals, please donate generously at https://www.canadahelps.org/en/pages/marathon-for-mental-health-2018/.